Filmmaker Erin Davies will be at UBC Okanagan for a screening of her documentary Fagbug, at 4 p.m. Tuesday in the University Centre cinema. Next Monday a rainbow Pride flag will be raised in the university courtyard to officially kick off a week-long series of events for UBC Okanagan's fourth annual OutWeek. The events aim to promote diversity, awareness and acceptance, as well as show support for LGBQTTI (lesbian, gay, bisexual, transgender, queer/questioning, transsexual, two-spirit, and intersex) students, faculty and staff. "Outweek is an important event as it showcases a part of our university community that is not necessarily acknowledged all the time," says Leah Bailey, President of the Pride Centre at UBC Okanagan, noting that the LGBQTTI community is an invisible minority. "By having OutWeek, the university is promoting diversity and awareness, but in a comfortable way that makes people feel like they, too, can be included, regardless of orientation or belief." The theme of this year's OutWeek is "You don't have to be gay to celebrate, watch, talk, play and party," and a number of inclusive events are scheduled throughout the week. Highlights include the flag-raising ceremony at noon Monday, a resource fair, the theatre performance My Funny Valentine, and a showing of a documentary by Erin Davies. 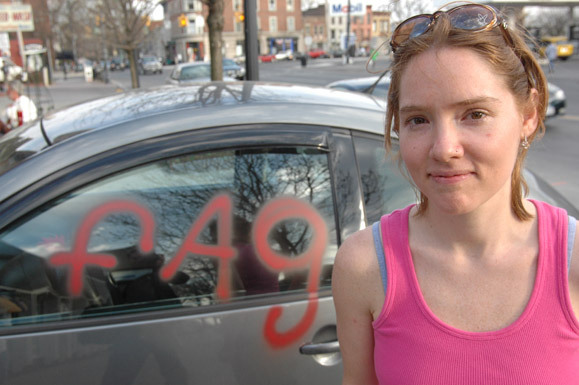 Davies' award-winning film Fagbug depicts one woman's journey across Canada and the U.S. after her Volkswagen Beetle was vandalized with the words "fag" and "u r gay." It will be shown Tuesday, Feb. 9 at 4 p.m. in the cinema, first floor of the University Centre (admission by donation). Kelowna Mayor Sharon Shepherd will introduce Davies, and the filmmaker will take questions from the audience following the screening. "The film was put together in a way that would draw people in who may not otherwise care about hate crimes or homophobia," says Davies. "It's a message anyone can relate to from any background. By driving the car for a year with the graffiti, and for an additional year and a half with the rainbow Fagbug vinyl wrap, I'm able to break into the general public, spread awareness and give a personal face to the story while taking a stand and fighting for what's right." Second-year UBC Okanagan history student Daniel Sadler intends to take part in some of the OutWeek festivities, and says the event is a very positive initiative that highlights the unseen minority aspect of the campus community. "A lot of people go through university trying to figure out who they are, and there are a number of questions that come with that," says Sadler. "No matter your sexuality, many people don't understand what it means to be gay. This event encourages discussion and casts the LGBQTTI community in a positive light, rather than the stereotypes that are reinforced by the media." Friday, Feb. 12 -- HoMotown, the Habitat, ($10 tickets at the door), 248 Leon Ave., Kelowna (tickets at the door) 8 p.m. For more information, contact Michael V. Smith at 250-807-9706.